KATHMANDU, June 23: The equity market maintained an overall negative bias this week. 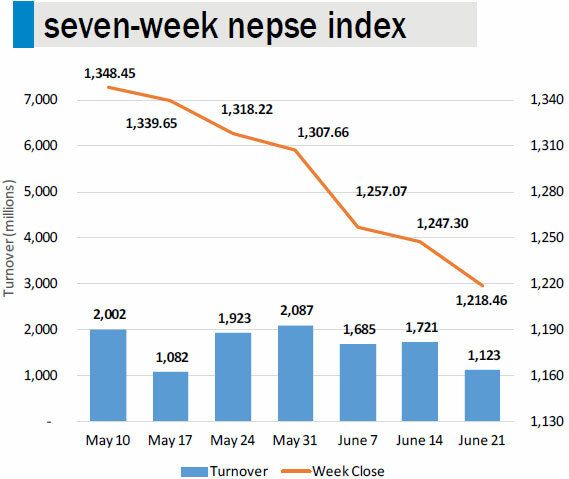 The Nepal Stock Exchange (Nepse) index posted losses of more than 8 points in three out of five trading days, while the remaining two trading days witnessed gains of less than 2 points only. Consequently, the benchmark index ended the week 28.84 points lower at 1,218.46 points. The market extended losses further this week, fueling continuation of the long-term downtrend in action. Stocks made an attempt to consolidate last week. However, amid a lack of any major catalyst ahead of the new monetary policy and among bland trading sessions, the market failed to gain any foothold for recovery. The exchange witnessed a minimal turnover of Rs. 1,123 million – a decline of 34.72 percent compared to a week earlier. Performance of Class 'A' stocks also suffered with the Sensitive Index declining losing points, or 2.31 percent, to finish at 255.75 points. Weakness was also visible among all sub-indices. Insurance sector turned in the worst performance of the week as its sub-index tumbled 2.79 percent. Hydropower and Microfinance sub-indices followed suit posing loss of 2.6 percent each. The Banking Sub-index fell 2.37 percent. Nepal Bank Ltd was the most active stock of the week as investors scrambled to buy its shares after Securities Board of Nepal (Sebon) approved the bank's Further Public Offering (FPO) of over 17 million units of shares at Rs 280 per unit on Sunday. Shares worth Rs 73 million of the bank changed hands during the week. Similarly, shares worth Rs 47 million of Mega Bank Ltd were traded in the secondary market this week. Next on the list was NMB Bank Ltd with Rs 46 million units worth of shares traded. The bank's FPO of over 11 million units is currently undergoing. More than 16 million units of shares of various companies were listed for trading in the secondary market this week. It includes 397,800 units of bonus shares of Nerude Laghubitta Bittiya Sanstha Ltd and right shares of Asian Life Insurance Co Ltd, Neco Life Insurance Co Ltd, among others. In news, Nepse has published a schedule regarding implementation of the fully automated online trading system. As per the press release issued by the bourse on Friday, transaction test and user acceptance test will begin on the first day of next fiscal year i.e. July 17. Hence, access to the online trading platform to general public can be expected soon after. As per the ARKS technical analysis, market witnessed extension of the downtrend with the index sliding 2.31 percent this week. With the week's decline, the index is trading near the support zone of 1,200 points as well as below 20-day and 50-day moving averages (MAs), suggesting that bearish trend is still predominant in the current scenario.